Never Blade or Chunk the Ball Again! Poor short game performance comes when your wrists break down and your hands lag behind the ball, lifting the club up before impact to blade the ball and miss the impact position entirely. The single best way to lower your score is to improve your short game. The Impact Master is a golf instruction aid that is fundamental to training just where in your swing you are breaking down. Never again watch with embarrassment as your ball moves uncontrollably across the green. Lower your handicap. When your short game is off, it is because you didn’t keep your wrists firm and straight throughout your swing, causing your hands to lag behind the ball and flipping the wedge up before you strike the ball. The result is the ball screams unpredictably across the green. Stay in position to get the ball up and in the hole! The secret to playing great golf is taking to the course exactly what you’ve perfected on the range. That’s why the Impact Master is ideal: the club you train with is the club you play with. The club you are the most comfortable with and train with is the one that you will have the most confidence using on the course. Impact Master will get the ball moving toward your target with consistent loft and backspin. The Impact Master is a high-quality, state-of-the-art golf club that happens to double as a training aid. The wedge was designed by Clay Long, personal Club Designer for Jack Nicklaus and has all the design features demanded by great wedge players of our time. The beveled sole is perfect for tight lies and has a 12° bounce. The perfect look at address is what professional Tour players demand in a wedge. 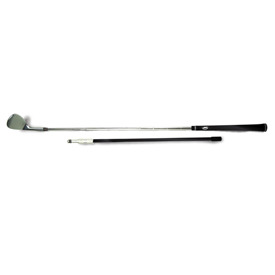 Special bevel back allows for opening the wedge on a hard, tight lie and have no fear of bouncing off the turf. Top teaching pros endorse it. PGA Tour players train with it. If your wrists start to break down, the extension will tap your side. If your lower body motions toward the target instead of turning with your hips, the extension will again tap you in the side, providing you instant feedback that you need to make a correction. It’s like having an instructor beside you telling you exactly what you did wrong and how to correct it. If you have any questions regarding the Impact Master, please give us a call, we would be happy to help you with any questions you may have. Write an online review on the Impact Master, and share your thoughts with others.